Brussels - Coal pollution and its health impacts travel far beyond borders, and a full coal phase-out in the EU would bring enormous benefits for all citizens across the continent. That is according to a new report published today by the Health and Environment Alliance (HEAL), Climate Action Network (CAN) Europe, the WWF European Policy Office and Sandbag. 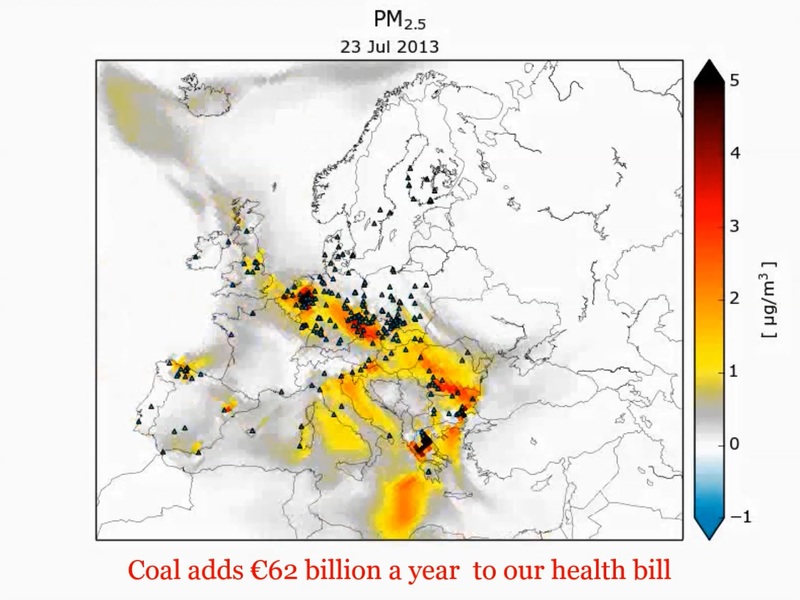 The report, ‘Europe’s dark cloud: How coal-burning countries make their neighbours sick’, analyses the health impacts from air pollution of all EU coal-fired power stations for which data is available (257 out of 280). It reveals that in 2013 their emissions were responsible for over 22,900 premature deaths, tens of thousands of cases of ill-health from heart disease to bronchitis, and up to EUR 62.3 billion in health costs. For the first time, the report analyses how the harmful dust caused by coal plants travels across borders and the effect this has. The five EU countries whose coal power plants do the most harm abroad are Poland (causing 4,690 premature deaths abroad); Germany (2,490); Romania (1,660); Bulgaria (1,390) and the UK (1,350). The five EU countries most heavily impacted by coal pollution from neighbouring countries, in addition to that from their own plants are: Germany (3,630 premature deaths altogether), Italy (1,610); France (1,380); Greece (1,050) and Hungary (700). The report shows that each coal power plant closed provides a major boost for the health not only of those living nearby, but also for those abroad: the UK planned phase-out of coal by 2025 could save up to 2,870 lives every year - more than 1,300 of them in continental Europe. If Germany decides to phase out coal, it could avoid more than 1,860 premature deaths domestically and almost 2,500 abroad every year. “The report underlines the high costs to health that come with our reliance on coal power generation. And it also debunks the myth that coal is a cheap energy source. Clearly, no country on its own can solve the problem of air pollution from energy production. We hope that the EU and member states take this evidence to heart and act for cleaner air,” - Anne Stauffer, Deputy Director of Health and Environment Alliance (HEAL) said. “The report shows that every coal-fired power station switched off will bring great benefits reaching beyond national borders, for both human health as well as climate” – Wendel Trio, Director of Climate Action Network Europe concluded. “After the Paris Climate Agreement, EU leaders have even more responsibility to dramatically ramp up efforts to shut down all coal power plants and swiftly move to 100% renewable energy”. “Air pollution is responsible for millions of deaths worldwide. Higher temperatures resulting from climate change will exacerbate the problem. The good news is that reducing our use of fossil fuels – including harmful emissions from coal - provides a unique opportunity to improve air quality and mitigate climate change thus protecting health from the greatest public health challenge of this century,” says Dr Roberto Bertollini, Chief Scientist and World Health Organization (WHO) Representative to the European Union. “The external costs to health from coal power generation are bigger than for any other energy source. The costs of reducing greenhouse gases are partially paid back because of lower health costs,” according to Professor Paul Wilkinson, London School of Hygiene and Tropical Medicine (LSHTM). “This report brings further insights into the harm coal power generation does to our health. It shows us why everybody should be concerned about coal power plants. The harmful emissions from each single plant can cause significant health impacts and health bills. A full coal phase-out is needed,” according to Dr Michal Krzyzanowski, former World Health Organization expert on air quality and currently Visiting Professor, Environmental Research Group, King's College London. “The media has recently drawn public attention to car exhausts but other sources, such as emissions from coal power plants, are also very important. The ‘Dark Cloud’ report makes clear that coal power plants are a considerable source of air pollution. In addition, the report quantifies the adverse health impact and health costs of transboundary emissions from coal power plants for the very first time. This provides a further argument to phase-out coal in the energy mix,” says Dr Joachim Heinrich, LMU, Institute and Outpatient Clinic for Occupational, Social and Environmental Medicine, University Hospital Munich. The Health and Environment Alliance (HEAL) is a leading European not-for-profit organisation addressing how the environment affects health in the European Union (EU). We demonstrate how policy changes can help protect health and enhance people’s quality of life. HEAL has more than 70 member organisations, representing networks of health professionals, non-profit health insurers, patients, citizens, women, youth and environmental experts working at the international, EU, national and local level. Together, we help to bring independent expertise and evidence from the health community to different decision-making processes. Sandbag is an evidence-based non-profit organisation to help European decarbonisation. We focus on phasing out coal generation across Europe, getting a higher carbon price through EUETS reform, and working on long term ways to decarbonise energy intensive industries.